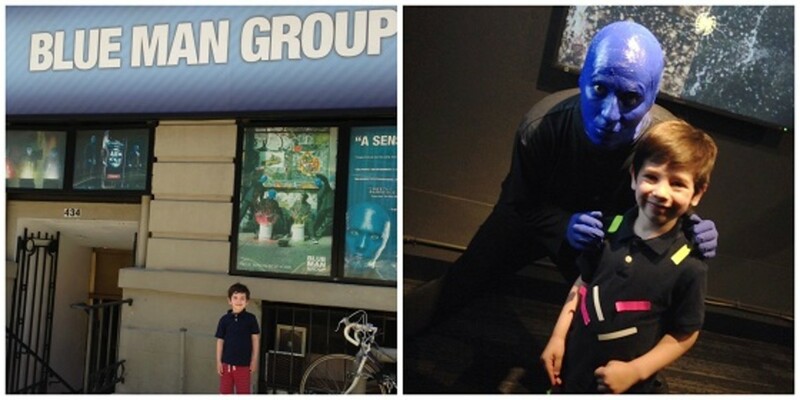 If you haven't seen Blue Man Group New York with your kids, it's time to revisit. The show has been updated and is good, innocent fun for the entire family. I&apos;ve been racking my brain trying to remember the year I first saw Blue Man Group New York. I was with my parents and brother which leads me to believe it was the mid to late nineties. All these years later, the wordless theatrical show is still going strong, a true testament to its broad appeal. I saw it again today with completely new eyes thanks to my adorable, soon-to-be five year old date. Manhattan offers a lot in the way of mommy/daughter activities and while I think Blue Man Group appeals equally to both boys and girls, I was happy to have a non-zoo/museum/park date with Sebastian. He absolutely loved the show; no surprise given it&apos;s fast-pace, loud music, and Gallagher-esque messiness. If you haven&apos;t seen the show with your kids, I highly recommend it. It&apos;s good innocent fun and it&apos;s a show the whole family can see together. There&apos;s no intermission (thank you, thank you!) and the theater is small, intimate, and conveniently located. It&apos;s recommended for ages 3+ but I think 4+ based on the loud music and prolonged periods of darkness. The show&apos;s content has been updated to explore technology and the way it both surrounds and isolates us, which is very clever and entertaining for older audiences. As for the little ones, when I asked Sebastian his favorite part of the show he asserted, "the drums with the paint!" I personally liked the never-ending streams of toilet paper. Need I explain more? There are all kinds of fun packages you can buy to see the show including Family VIP, Birthday Parties, and group discounts. Contact Group Sales for more information at (212) 260-8993 or newyorkgroups@blueman.com. WIN IT! I have two vouchers good for two tickets each (4 tickets total) to a Blue Man Group performance of your choice at the Astor Place Theatre Sunday - Thursday until September 30, 2014. If you&apos;re interested in them, leave a comment below. I&apos;ll randomly choose a winner in a week. Need more family fun ideas in the city? Here are other Glamamom-approved things to do in NYC with kids.